Standard Vacu-Stack caps cure most wind-related backpuffing problems. Now with this new model, you can have that cure for your pre-fab fireplace as well. 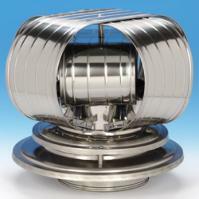 Like the air-insulated Weathershield, it is 15 5/8" in diameter and is made specifically for air-insulated chimneys. Comes with a Lifetime warranty. Fits 10 inch diameter chimney. Fits 6 inch diameter chimney. Fits 8 inch diameter chimney.